Jessie’s “Scotch Mother” sends a gift and congratulations on her wedding. This will arrive late because I have been not seriously but really helplessly unwell for the last two weeks. 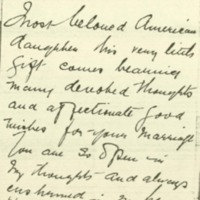 Wilson, Ellen Axson, “Your Scotch Mother to Jessie Woodrow Wilson,” 1913 November 12, WWP17467, Jessie Wilson Sayre Correspondence, Woodrow Wilson Presidential Library & Museum, Staunton, Virginia.